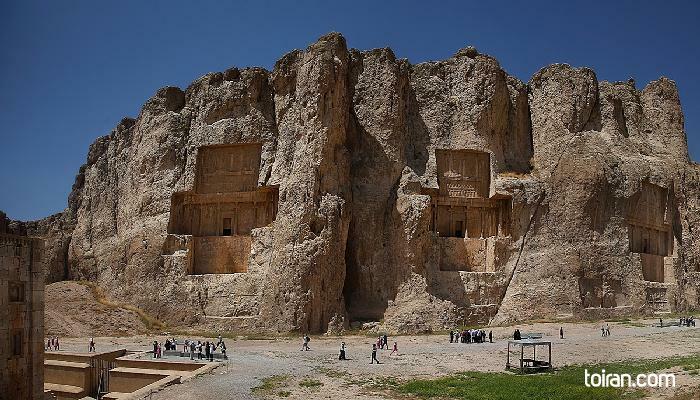 Naqsh-e Rostam is a site believed to have been a cemetery for Persepolis, where Achaemenid (550-330 BCE), Parthian (247 BC–224 CE) and Sassanid (226-651 CE) royalty were laid to rest. 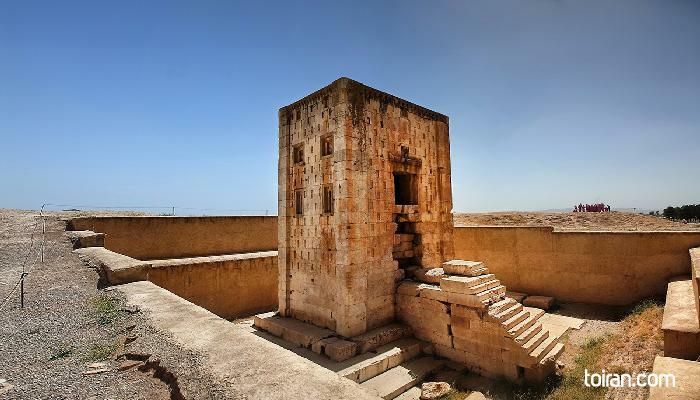 Located about 3-4 kilometers northwest of Persepolis, the site also contains funerary related works belonging to the Elamite (second millennium BC) era. Hewn out of a cliff high above the ground are four Achaemenid tombs reputed to have belonged to Xerxes (519 -466 BC), Darius I (550-486 BC), Artaxerxes (?- 424 BC) and Darius II (?- 404 BC). 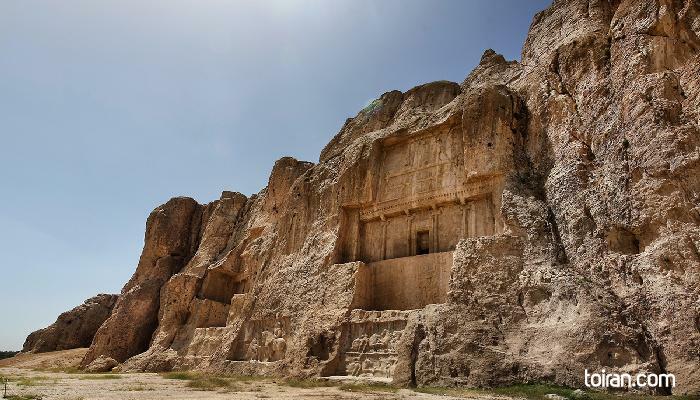 According to Greek historian Ctesias, the tomb of Darius I was in a cliff face that could be reached only by means of an apparatus of ropes. The openings in the massive tombs led to the funerary chambers, where bones were stored after vultures picked them clean and the reliefs above the openings resemble that of Persepolis with the kings standing at Zoroastrian fire altars supported by figures representing the subject nations below. Naqsh-e Rostam structures have been built from white and grey limestone without the use of mortar. 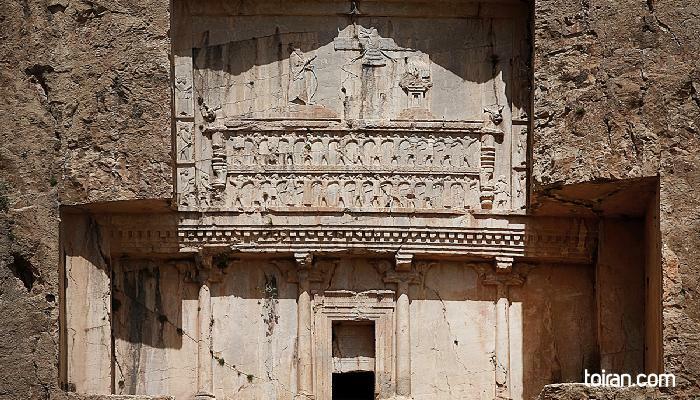 The site has seven elaborate Sassanid rock reliefs cut into the cliff beneath the facades of the Achaemenid tombs, which depict scenes of imperial conquests and royal ceremonies. 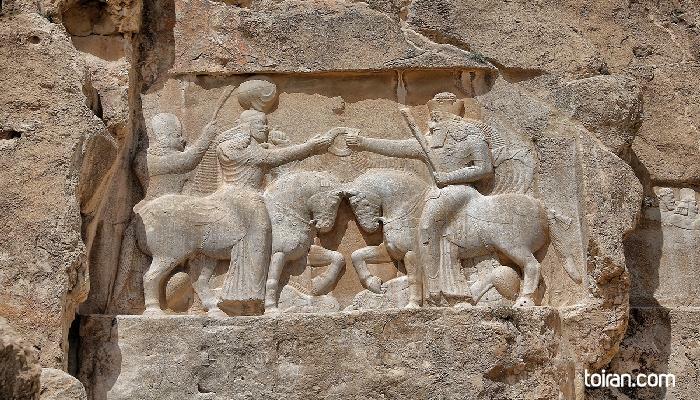 The oldest relief carved near the Elamite relief depicts the appointment of Ardashir I (180-242 CE) by Ahuramazda and his receiving the ring of kingship. 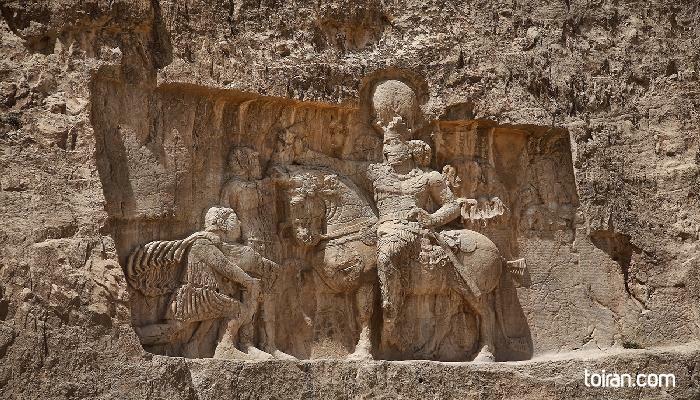 Ardashir's successor, Shapur I (241-272 CE), was the next to carve his "Victory over the Romans" and the scene of his triumph over Roman Emperor Valerian (reign 253–260 CE) on a relief standing near the Darius tomb. The third relief, carved over the Elamite relief, shows Bahram II (273-293 CE) with members of his family and court. The remnants of the scene show an attendant standing behind two deities seated on layered thrones resembling coiled snakes. 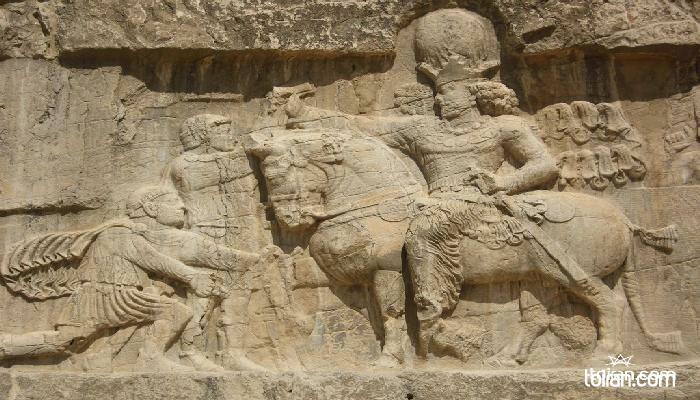 A fourth relief shows the victory of Bahram II. There is another relief directly below this one which is believed to have depicted Bahram III (?-293 CE) whose reign was ended after only four months. A fifth relief shows the ascension of Narseh (?-302 CE) and his receiving of the ring of Kingship from a figure believed to be Anahita, the Persian water goddess. A sixth relief depicts Hormizd II (?-309 CE) on a horse slaying an enemy with his spear. A seventh relief depicts Shapur II (309-379 CE) slaying his enemies. There is an eighth slab which was prepared for another royal scene but which was never used. Naqsh-e Rostam is currently pending approval by UNESCO as a World Heritage Site.